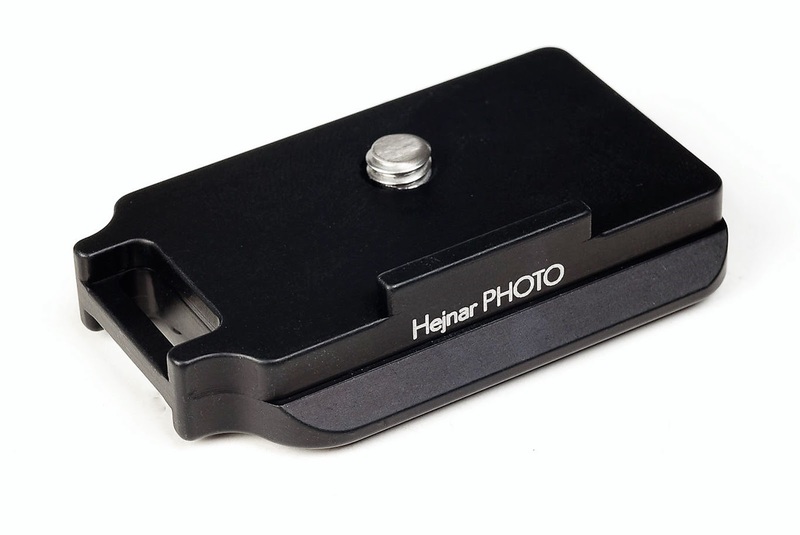 The Hejnar Photo family of quick release plates for the Fujifilm series of cameras has been enriched yet with another member. This time a dedicated plate for the newer Fujifilm X-H1 has been released by he end of March 2018. The new plate seems to share the same small footprint as the other members of the family, but the layout is somewhat different as we shall see in detail below. 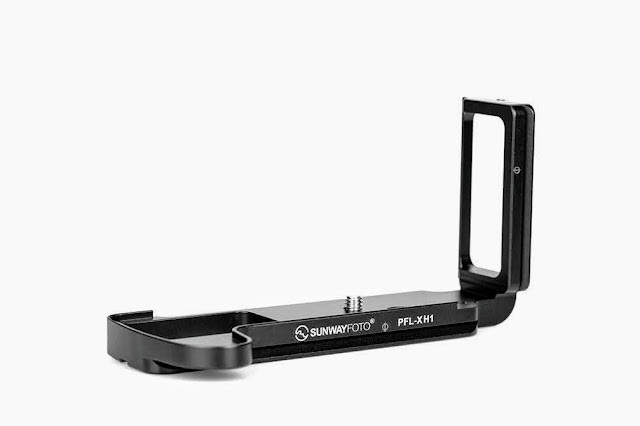 The plate is designed to sit centered below the lens making it easier to align its longitudinal axis on a tripod head, while permitting full access to the battery and memory compartment. One central ridges at the front, takes care so the plate does not twist when forced sideways. 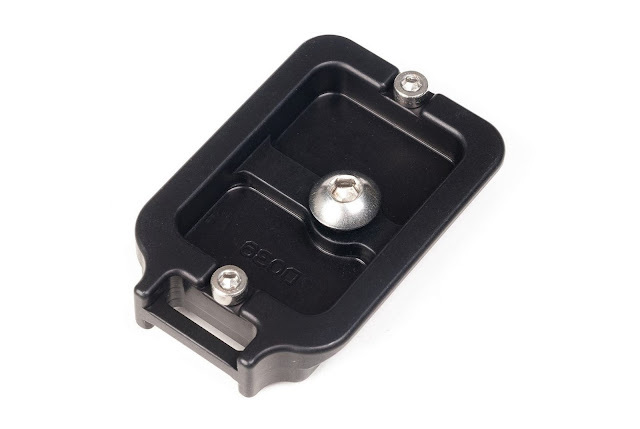 The plate's dovetail follows exactly the Arca standard geometry, making it compatible with almost all Arca style QR clamps, even RRS® lever release clamps. 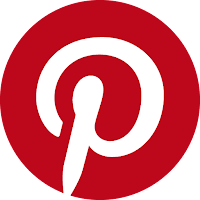 It extends equally on both sides at the bottom of the plate, making upper surface a little narrower. The D039 QR Plate is flat and differs from its siblings with a captive hole for the 1/4"-20 mounting screw in the middle instead of a captive slot on one side. This was made feasible of course, since Fujifilm decided at last to accommodate the 1/4"-20 tripod socket exactly under the lens, by reinforcing the plastic bottom cover. As usual a strap loop exists on the right side. 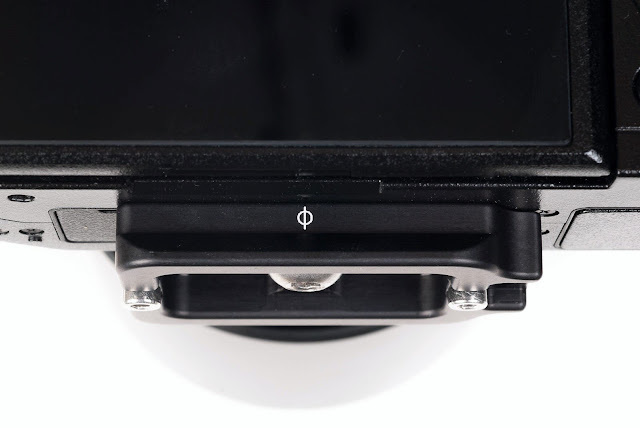 A Φ center mark on the rear indicates the lens centering point when mounting on a QR clamp. The plate bottom follows the standard Hejnar hollowed out design, with a central brace reinforcing the 1/4"-20 tapped captive hole. 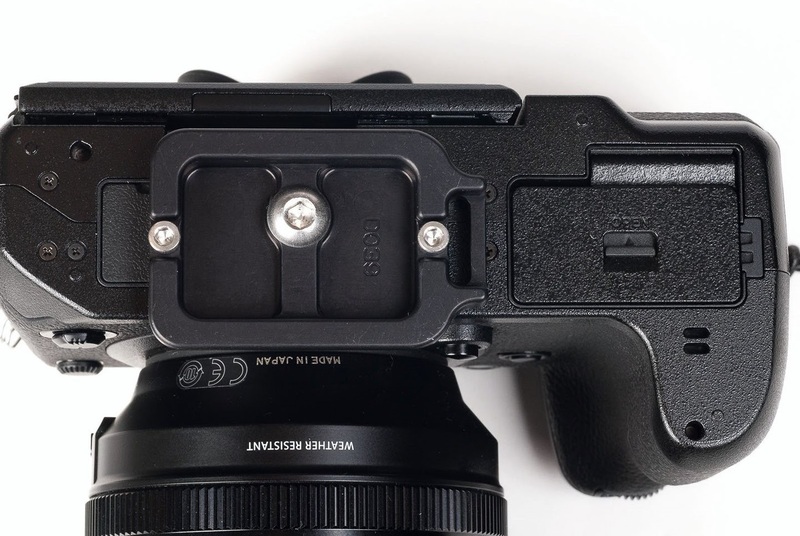 Due to the mounting screw relocation in the middle of the plate, there are two M3 safety stop screws, one on either end, instead of one on previous Fuji models. The D039 QR plate sits unobtrusively under the camera deep enough to allow for the LCD screen to tilt in all directions without any problem. 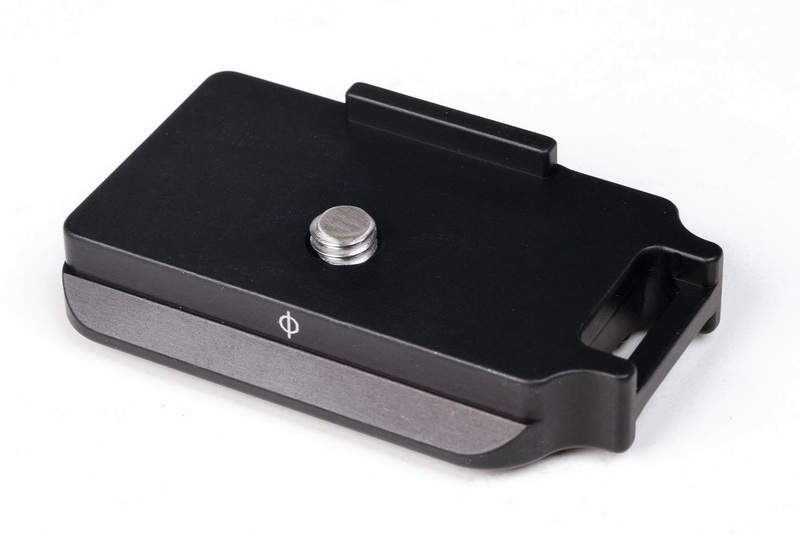 As also mentioned in the beginning it allows full access to the battery compartment as well. 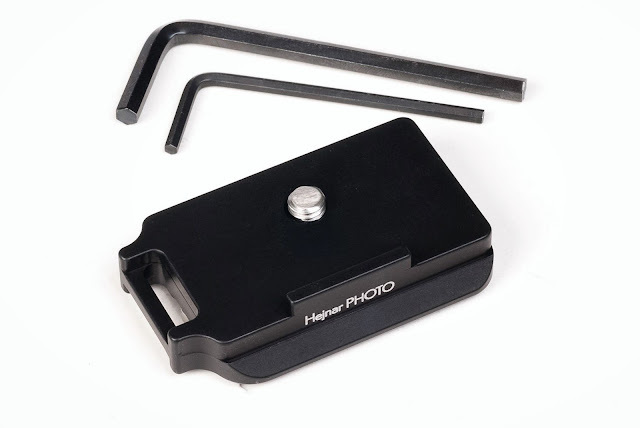 As all Hejnar QR plates dedicated and universal, the D039 comes complete with the necessary size Allen Hex keys for the 1/4"-20 mounting screw and the M3 safety stop screws. Current price for the D039 QR Plate for Fujifilm X-H1 is US$ 38.00 (+Shipping where applicable) and is available from Hejnar PHOTO online Store. If you are interested in the product, do check the Recommended Sellers page for a valid Hejnar Photo discount coupon before placing your order.